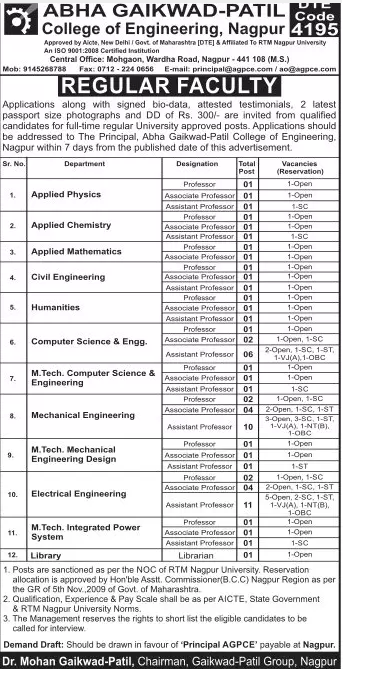 Abha Gaikwad-Patil College Nagpur (Abha Gaikwad-Patil College of Engineering), Nagpur Published Job Notification for 66 Professor – Assistant Professor & More Posts. Candidates who wish to apply must look at Abha Gaikwad-Patil College Nagpur Professor – Assistant Professor & More Recruitment 2018. Eligible candidates can apply Offline before 26-07-2018. Interested & Eligible candidates can send their application along with all the necessary documents and testimonials to Principal, Abha Gaikwad-Patil college of Engineering , Mohgaon, Wardha road, Nagpur – 441108, Maharashstra, India. Application Fee: Rs. 300/- (DD). Starting Date, Last Date to Apply Offline at Abha Gaikwad-Patil College of Engineering which candidates should be remembers as follows. Last Date to Apply Offline: 26-07-2018.